If you don't know what PlayStation Vue is, don't worry, you're not alone. It's not a gaming service of any kind, it's an IPTV subscription that delivers select shows and networks to the PlayStation 3 and PlayStation 4. It's a sort of hardware-exclusive take on SlingTV. Or at least it was, until Sony announced that the service was expanding to other streaming devices. Amazon's Fire TV and Fire TV Stick will be the first non-Sony hardware compatible with PlayStation Vue, not counting iPhone and iPad. Apparently there are still no plans for core Android app, but the service will expand to the Chromecast (and presumably Android TV by way of its built-in Cast support) at some point in the future. That may require an Android app in any case - otherwise there would need to be some way to Cast directly from a PlayStation console, since the Chromecast doesn't hold apps in its small storage. Sony didn't mention any sort of date for Chromecast support. PlayStation Vue starts at a pricey $50 a month, with charges going up to $70 a month if you add premium channels like Showtime and Fox Sports. 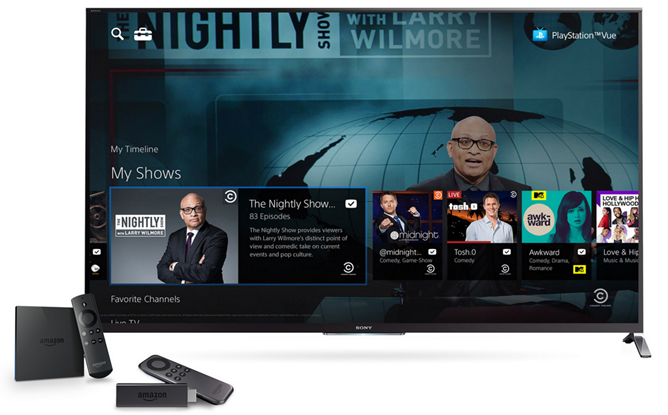 You don't need a PlayStation console to sign up for PlayStation Vue if you have a Fire TV device, and Sony is offering a free Fire TV Stick to new subscribers who choose the Core or Elite package starting on November 15th.